Sarah teaches, performs, and proselytizes polyphony in the Boston area. She founded Nota Bene Viol Consort in 2012 with Wendy Gillespie, Emily Walhout, and Joanna Blendulf. With their matched set of Renaissance viols, they have pursued a number of projects focusing on 16th-c. polyphony, while in other programs they have explored repertoire from 17th-c. chromaticism to 20th-c. jazz. She has given solo concerts on the lyra-viol across the US and overseas, and has performed with some of this country's leading early music ensembles. 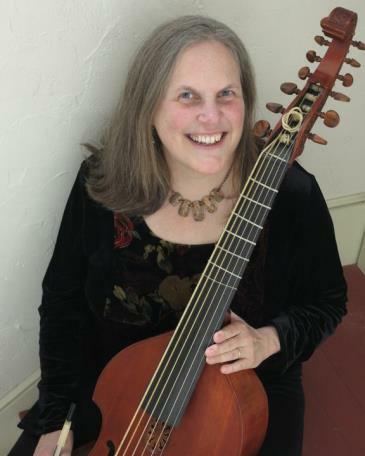 The 2007 recipient of the Thomas Binkley Award from Early Music America, Ms. Mead is currently Professor of the Practice of Music at Brandeis University. She has led immersive courses on 16th-c. theory at Oberlin, Juilliard, and the Longy School of Music. Her handbook on Renaissance Theory is used in historical music programs around the country. She has given master-classes, lectures, and workshops in Brazil, Japan, Australia, New Zealand and the UK. For seven years she was Conclave Music Director for the Viola da Gamba Society of America, for which she has been a regular faculty-member since 1987. This will be Sarah’s second time teaching at the PTEMW. She dazzled everyone in 2017 by stepping in at the last minute when another faculty member was unable to come. We are looking forward to having her back. Watch Sarah Mead perform an Ayre by Mr. John Jenkins and a Coranto by Dr. Charles Coleman (both from the Manchester Lyra-Viol Book) on a lyra viol with sympathetic strings built by Dom Zuchowicz, at the concert celebrating his life and his instruments.